Ergonomic Solutions provided this Ford Transit van's mobile office equipment. The desk includes space for a laptop and printer, as well as drawers and baskets for storing files and papers. Photo courtesy of Ergonomic Solutions. As technology enables work to be done anywhere, there has been an increasing trend toward mobile offices. 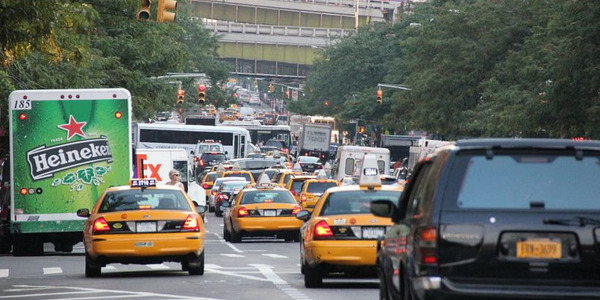 With access to a power source for charging a laptop computer, printer, or other electronics, the office environment can be fully functional in a vehicle. Today, mobile office functionality isn’t limited to vans — some mobility features are also being used in sedans and trucks. 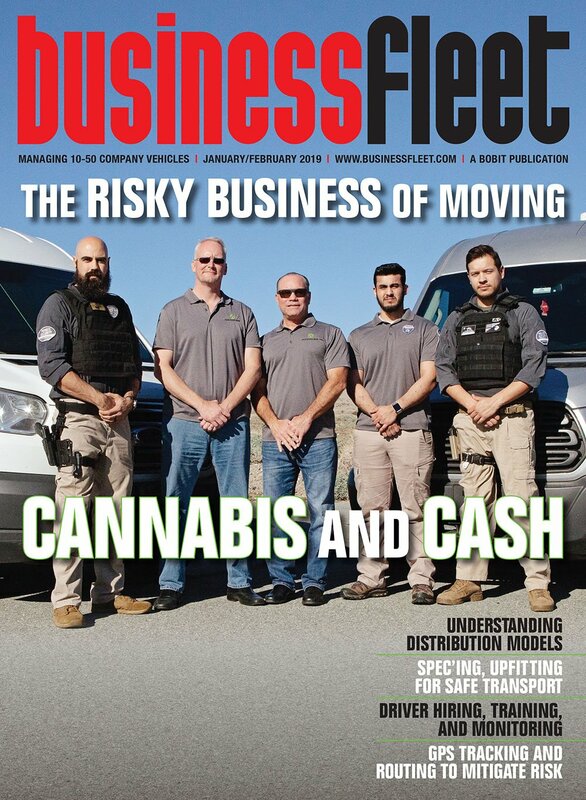 “Approximately 25% of our mobile customers work out of their cars while the rest work out of small or large vans,” says Jill Clark, president of Ergonomic Solutions, a provider of ergonomic furniture for mobile offices. 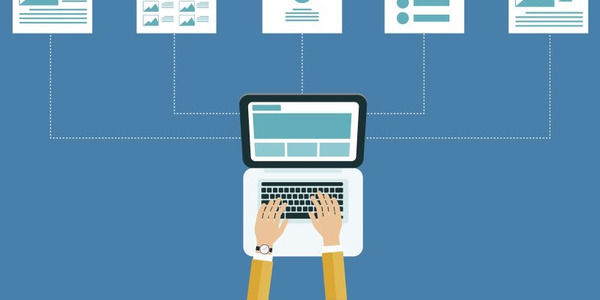 A mobile office is a broad concept and can encompass everything from using wireless smartphones and tablets to setting up a mobile desk in the back seat of a sedan or truck to mounting a desk and chair in the back of a van. 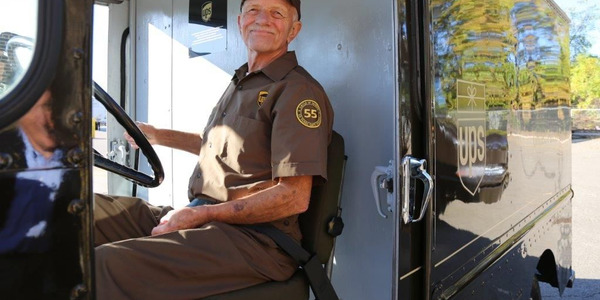 Will a fleet implement a lighter version of mobility or invest in upfitting the vehicle with office equipment or other customizations? 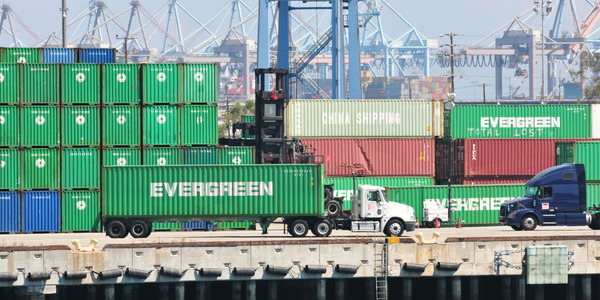 Some fleets provide the minimum: power to charge laptops, portable printers, and smartphones, according to Foster, while others might provide a mobile desk or laptop stand. The next level is a full mobile office with a mounted desk and chair, for which a cargo van or large truck is best suited. Foster breaks mobile offices into two segments: heavy duty and lighter duty. The lighter-duty application is more about ergonomic benefits, such as workspace for on-site insurance claims adjusters. It usually includes a comfortable chair, a desk with space for a laptop and printer, and storage drawers or baskets. The heavy-duty side is used more as a command center at a work site for industries such as railroad, construction, and utilities, according to Foster. These types of mobile offices are usually created in heavy-duty vehicles like class 6 or 7 trucks and include more storage options for work equipment and tools. 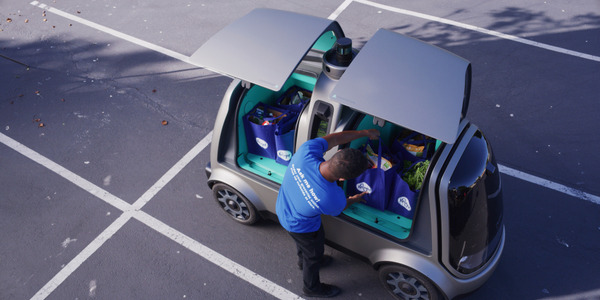 Nissan’s NV and NV200 vans, and Ford’s Transit Connect, provide another function for the passenger seat — it folds flat. 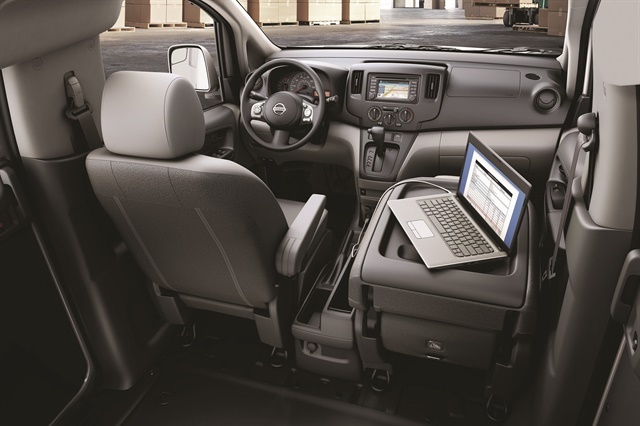 “On the back of the passenger seat’s surface, we designed a working desk area,” says Mark Namuth, Nissan’s senior manager of commercial vehicles. On the back of the passenger seat's surface in the NV and NV200 vans, Nissan added a desktop where a fleet driver can write and put his or her laptop. Photo courtesy of Nissan. 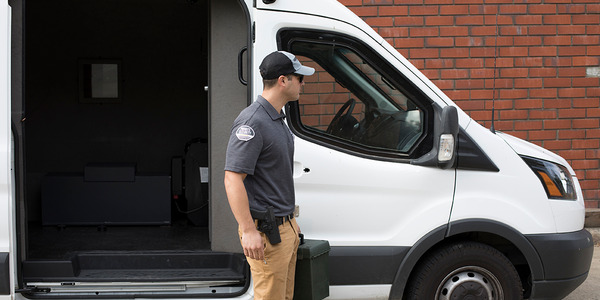 One of Ford’s Transit van’s options — the Builders Prep Package on the passenger wagon — strips out the seats and leaves the trim, climate control (air conditioning and heating), LED lights, and back windows. 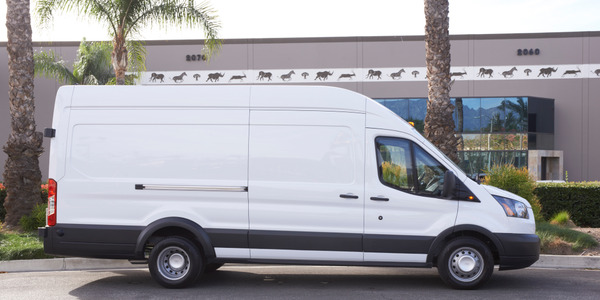 This leaves space for an upfitter to add a desk and other equipment to the back, says Yaro Hetman, Ford’s brand manager for the Transit, Transit Connect, and E-Series vans. 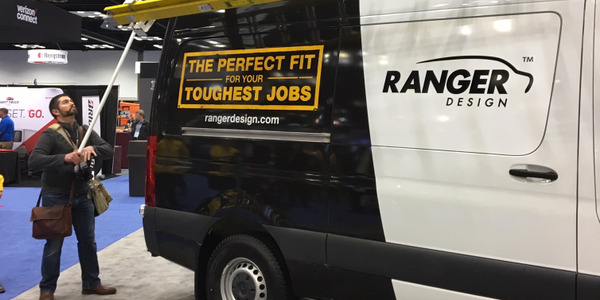 The Chevrolet Express and City Express vans come standard with reinforced mounting points with cargo hooks, according to Langhauser, which can be used to tie down equipment or upfit the cargo area to resemble a workspace. OEMs are also starting to provide extra power as a standard or an option, such as 12-volt, 110-volt, and 120-volt power outlets. For greater power needs, Chevrolet offers an optional second isolated battery that can be used as another power source when the vehicle isn’t running, says Langhauser. The Transit offers the AGM battery as an option, says Hetman. The NV and NV200 have a battery disconnect feature that will automatically shut down if the battery gets below the voltage to start the vehicle, according to Namuth. Storage is another key element to an organized workspace — and it’s not limited to the cargo vans. The NV’s center console contains a hanging folder feature that holds a full-size laptop. The center console in Ford’s 2017 Super Duty trucks can hold two laptops and store file folders, says Hetman. Another new trend is Wi-Fi connectivity through a 4G-enabled mobile hotspot. 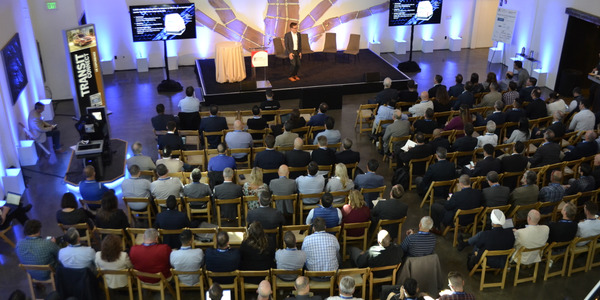 GM’s OnStar 4G connection allows passengers to connect to the high speed wireless internet, according to Rich Martinek, GM’s senior manager, Global Connected Customer. 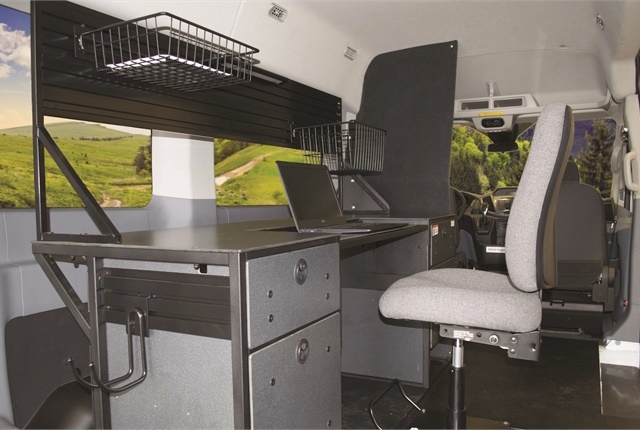 For more customized mobile offices, fleets turn to upfitters and customizers. Leggett & Platt has mobile office configurations for both small and full-size cargo van models. 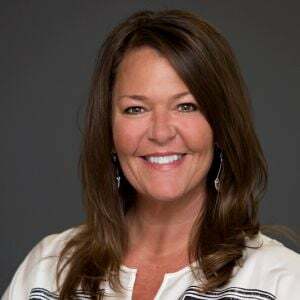 “Mobile offices used to only be in the large vans, but they are transferring into the smaller vans because equipment is getting more compact,” says Jenn Voelker, director of product development and engineering for Leggett & Platt. 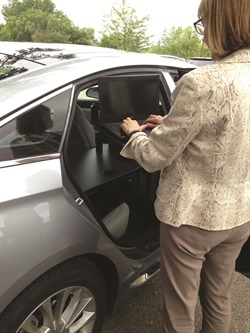 Jill Clark, president of Ergonomic Solutions, demonstrates how the desk can be used standing up outside the vehicle. The desk's arm can be raised or lowered depending on whether you want to sit or stand. Photo courtesy of Ergonomic Solutions. On the full-size cargo vans, most of Leggett & Platt’s customers prefer to use a passenger van because it has full windows that provide better lighting, according to Voelker. Passenger van models also tend to provide air conditioning to the back rows. Leggett & Platt’s mobile office package includes a desk, chair, flooring, security system, and power — usually an inverter — to charge technology equipment. Computers can be stored in a mounted docking solution or cradle while printers are secured in a printer stand, says Voelker. Auto Truck Group typically mounts the desk into the floor of the van. The desk — provided by Ergonomic Solutions — has space for a laptop and printer and contains drawers for folders. According to Foster, the chair sits on a sliding base, mounted to the floor. A custom bulkhead helps keep objects from flying forward. American Family Mutual Insurance Co. wanted a mobile office setup for its claims adjusters without having to upfit their fleet vehicles. The company tried a portable desk — with a power inverter — that could slide into its Dodge Caravan’s captain’s chair in the middle row. However, the desk was big and hard to maneuver, according to Switzky. A few years later, American Family discovered Ergonomic Solutions’ lighter-weight portable desk, which could fit in its sedans, SUVs, and vans — with no drilling required. American Family is starting to purchase Ergonomic Solutions’ sit/stand desk, which allows the adjuster to use the desk while sitting in the back seat or standing outside the vehicle, according to Switzky. The sit/stand desk features a swing arm to put the laptop, a spot to attach a portable printer, and drawers for storage; it can be folded and locked when not in use. To reduce the chance of distracted driving, Clark only provides solutions for the back seat. Mobile offices aren’t limited to just a desk and chair. Some upfitters customize a mobile office with everything from a TV to a conference center to a refreshment station. Creative Mobile Interiors customized this mobile leasing vehicle for Ohio-based Ardent Communities. The interior includes a desk, chair, bench-style seating for prospective customers, and an area to showcase floor plans of available properties. Photo courtesy of Creative Mobile Interiors. With the help of CMI, a custom coach company, Ardent Communities’ idea of a customized mobile office came to life. 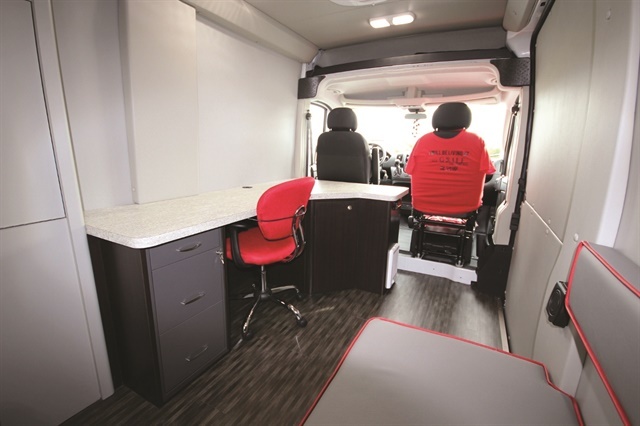 Starting with an empty ProMaster, the interior now features a desk, chair, bench-style seating for prospective customers, and an area to showcase floor plans of available properties. To jazz up the exterior, CMI created a flip-up window with a TV and speakers — “we can showcase our properties on the TV,” says French. CMI also helped C-SPAN create its customized mobile office vehicles. C-SPAN’s Ford Transit Connect vans serve as its offices when traveling to different cities to film. “CMI customized the inside of our vans so we can store all of our equipment, including laptops, lighting gear, TV equipment, and cameras,” says Mark Farkas, executive producer and head of C-SPAN Cities Tour. The back of each van features a storage unit that specifically keeps sensitive equipment safe in motion, according to Farkas.